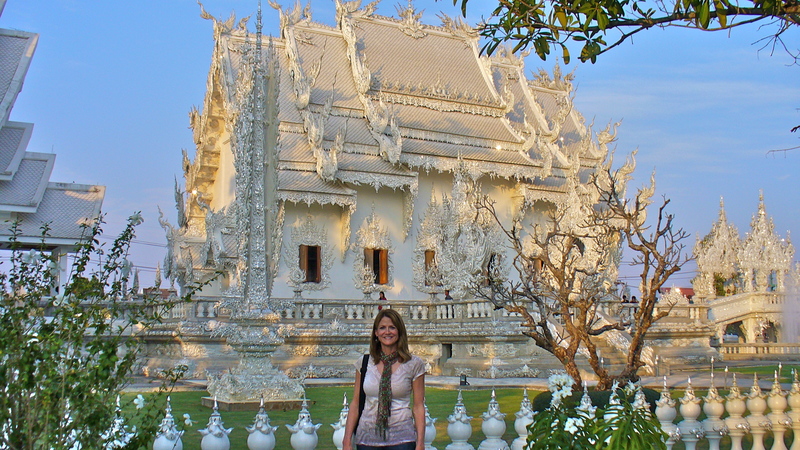 The Wat Rong Khun temple or “White Temple” is located in Chiang Rai, Thailand and we stopped there while en route from Chiang Mai to Chiang Khong. As you can see it is beautiful and very artistic. It was in fact designed by an artist named Chalermchai Kositpipat. The hands sculptures were on either side of the walkway at the front entrance! 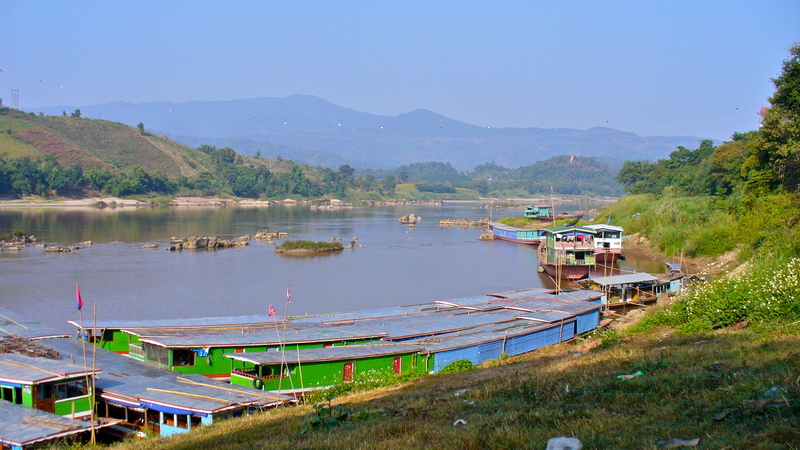 At the border of Laos we boarded this slow boat for an eight hour trip on the Mekong River. We had the boat all to ourselves! 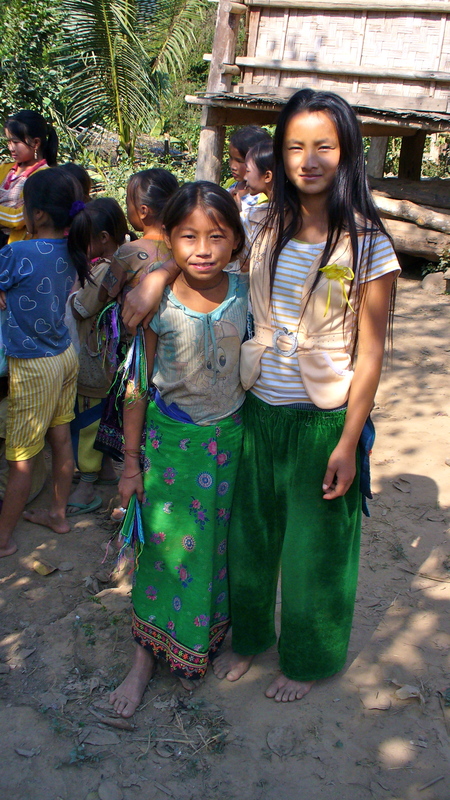 We stopped at a village where the Hmong hilltribe people lived in Laos…and a discussion began concerning happiness. One of the women on the trip felt very sorry for these people. They seemed quite happy to me! So long as people have a roof over their head, food to eat, clean water, and medical attention when necessary…especially if that is the life they have always led…then perhaps the simpler life style is less stressful. 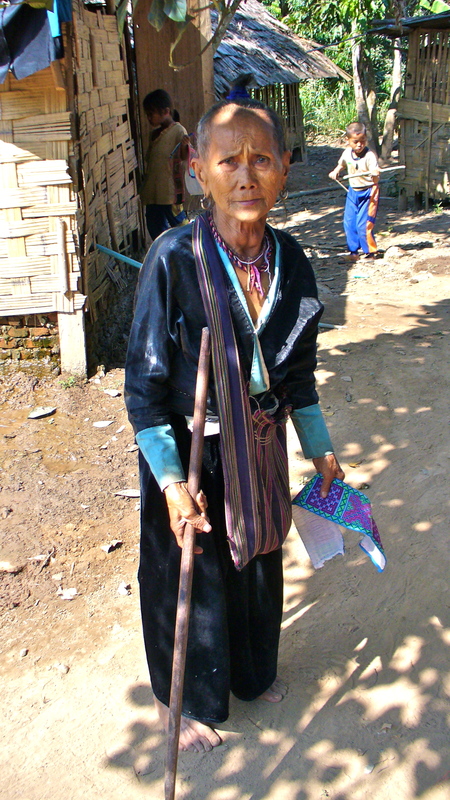 The history of Hmong people is very interesting…you should take a look. Next…more of Laos…followed by Vietnam! 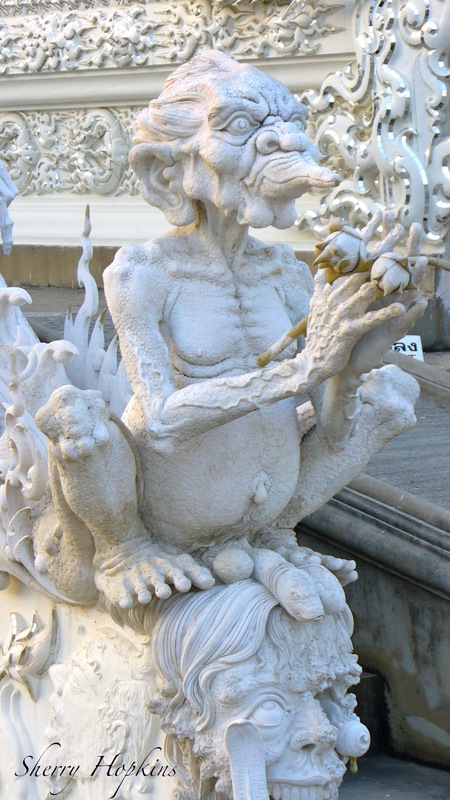 This is a gorgeous blog… take a look at the photo of the sculptured hands at the White Temple in Thailand! Very unusual and exquisite. Reblogged from Fabulous 50s by Travel Spirit. This is an excellent post. I love your photos of the Hmong people and the White Temple, but the most chillingly beautiful shot is that of the sculpted hands at the White Temple. There is so much energy in it; you really see them reaching. Wonderful and disturbing at the same time. What were they like in person? Did they give you goosebumps? Would you mind if I reblog this over at synkroniciti.com? Thanks for the follow at Katherine McDaniel, soprano. I don’t do much blogging there, unless I make a mistake in reblogging, which I do from time to time. 🙂 If you would like to follow the blog, please follow synkroniciti. Thank you! I can imagine it must be exhausting and exhilarating at the same time. Wow! The temple and the details of the temple are amazing. Just wanted to let you know I have been reading and enjoying your posts. I don’t always have time to comment because life has been so busy lately. I know what you mean…I do the same thing! But..thanks for letting me know. Wow. I have never seen a temple like that -White Temple. I think that it is very special. In my country we have Pink Church, but it cannot be compared with the beauty of this temple. Glad you enjoyed it…it is magnificent! Great post, Iw as pleased also to see again the beautiful Wat Rong Khun, I saw few years, ago, certainly one the best in Thailand, it’s the only White temple right ? Are there still selling some painting art inside the temple (I remember it was very colorful painting …). I saw so much in those two weeks, I don’t remember! that temple is really beautiful!!! Looks and sounds like a fabulous trip in Thailand. You have inspired me to consider my next travels to be in Asia. That’s great…the problem with travel is deciding where to go…too many wonderful choices! Magnificent art work on the temple, they really put everything into these temples, the amount of hard work for each and every sculpture is really incredible. It is wonderful to learn about how different people live in their environment, to learn about their culture. A wonderful post. The pictures of the White Temple took my breath away! It looks as though it is carved in frosted snow and ice – and what beautiful, eccentric works of art it contains – amazing. Thanks for sharing all your travel adventures. Amazing sculpture and architecture. Beautiful people. Just felt sorry for the monkey on the chain. You’ve taken some fantastic photos. Did you take extra memory cards for your camera or upload the photos to home somehow and keep on snapping? How did you manage so many photos? The memory card in my camera was usually sufficient. I would take about 400 shots per trip, which really isn’t that many. They came out nicely. Good quality for posting. Thanks for following and am happy I can entertain you! Wow – loved that white temple ! I will definately be stopping there when I get to Northern Thailand. Thanks for sharing it. Cool…I knew you were on your way! Have fun! So many different regions and people. The colorful dress of the Laotions(sp) from China origins is so bright. Wondering if I have all of that correct? The temple and the hands outside is like some kind of adoration I guess. I noticed the eyeball falling out of his head, crazy. I know…it was unlike any other temple I’ve seen! Are there rules for temples, quietness, shoes, etc.? Yes, your dress has to be modest, arms, knees covered and shoes off and quiet. That temple is so interesting! Love the way your photos captured bits of it. Thanks Kristin! It definitely glistened in the light! Great photos. That temple is completely crazy beautiful. Thanks…I read that it was started in 1997 and completed in 2008. But, they’re still adding to it now. Ah, the benefits of insomnia: discovering your post. That’s looking on the bright side! I’m glad you came to visit!